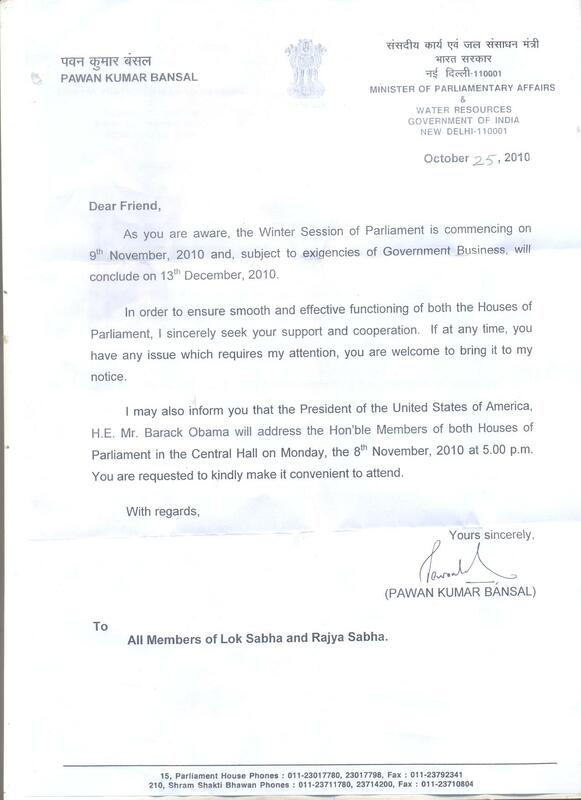 Parliamentary Affairs Minister Pawan Kumar Bansal has issued a letter inviting all Members of Parliament to attend United States President Barack Obama's address at the central hall on November 8. In a circular letter, Bansal also sought the cooperation of all the MPs to ensure the smooth functioning of both Houses of Parliament. The routine circular assumes significance as it specifically urges the Parliamentarians to attend Obama's address. As you are aware, the winter session of Parliament is commencing on 9th November, 2010 and subject to exigencies of Government Business will conclude on 13th December, 2010. In order to ensure smooth and effective functioning of both the houses of parliament I sincerely seek your support and cooperation. If at any time, you have any issue which requires my attention, you are welcome to bring it to my notice. I may also inform you that the President of United States of America H.E Mr Barak Obama will address the Hon Members of both houses of Parliament, in the Central Hall on Monday the 8th November, 2010 at 5 pm. You are requested to kindly make it convenient to attend.